A common moss that likes to grow in Florida is Spanish moss. This moss loves the humid climate and moisture that is in the air, and will attach itself to trees in order to thrive. This moss can grow very quickly and if it is not treated, can spread all over the tree. This moss is not truly a damaging moss in the sense that it could kill the tree. This moss is actually not a deadly threat to your trees, and it isn’t cause for too much concern in small amounts. You really shouldn’t worry too much about Spanish moss growth on your tree, but there are some things you can look out for. Spanish moss can harm your tree if it spreads too much, so here is some information that is helpful to know about Spanish moss. The first thing to know about Spanish moss is that it actually isn’t a moss at all. It is actually called a bromeliad, which is the same family as something like a pineapple. However, it still does grow on trees. Spanish moss does not have roots, and so it does not damage the tree in that way. The moss will take in nutrients from moisture and dust in the air, so it does not take away crucial nutrients from the tree itself. Spanish moss is also very helpful to nature. ​Spanish moss can be the home for birds and other creatures in trees. Spanish moss loves to grow in swampland areas, which is why you will see it a lot down south and in Florida. 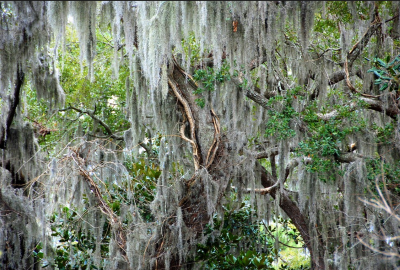 Spanish moss isn’t a huge problem when it comes to tree health if it is kept from growing rampant. However, if Spanish moss is becoming the only thing you see on your trees, it may be time to remove some of it. 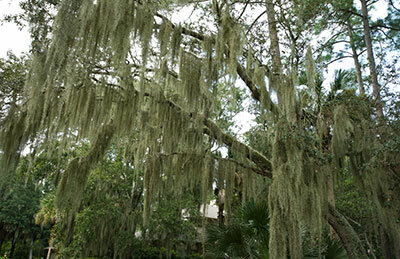 We have years of experience removing Spanish moss. If you have ever attempted to do this yourself, you know that it's not an easy task. You'll want to give us a call to stop by and have a look at the Spanish moss removal task and provide you with a free quote for removing it. This can be a hassle and worse, it could potentially be dangerous as it can also be home to things like snakes. We wouldn’t want you to have to deal with any snakes when trying to remove Spanish moss from your trees, which is why we offer Spanish moss removal. Spanish moss can be harmful for a few reasons if it grows too much on your trees. First, it can limit airflow for the tree if it grows all over, and can hurt the tree. It can also block sunlight, which isn’t too much of an issue since the moss will usually grow on trees in swamps, which don’t need too much sunlight. But, Spanish moss can be an issue, and should be removed if it grows in excess. ​Another issue is that the overgrowth of Spanish Moss can cause branches to fall of the tree from the weight of the moss. This is also why we highly recommend that a certified arborist tackle the job of removing the moss. Nobody wants to be removing the moss and have the branch break of because it has been weakened by the moss. But, all this being said, if your tree’s health isn’t looking so good and it has Spanish moss on it, the moss probably isn’t the problem. The moss doesn’t feed directly off of the tree, so it doesn’t take key nutrients from the tree directly. The moss can also store water in itself, so that if the conditions become dryer, it can survive. But saying that the moss most likely isn’t the problem is not saying that it can’t be the issue. We will be happy to remove any Spanish moss from any trees you may have. Whether the reason is that it is becoming too rampant in the trees, or it is causing branches to fall, or that it just simply looks bad, we will accept any reason. We understand that the Spanish moss can be causing your trees or you some issues, and we believe that it should only be certified arborists who remove it. We aren’t just saying this to get the job either. It is with our complete concern for your health and the health of the tree that we highly recommend hiring professionals to get the job done for you. We would hate it for you to have to try and remove Spanish moss by yourself without help of professionals. All the risks that are included in trying to get it out should not be in your concerns. So, if you need Spanish moss removed from your trees for any reason, give Sarasota Tree Care Services a call today.